Space Cheese you ask? Space Cheese is our scientific name for a certain polymer substance also known as Velveta Cheese. Sam and Miranda were sent several blocks of this stuff as gifts from home. They were kind enough to share this with us. One morning we woke up and made some biscuits with egg and space cheese, only to be greeted with tiny perforations in the aluminum wrapper. On first glance it looked to be the work of insects, but since it has been in the refrigerator the whole time, it’s wasn’t very plausible. 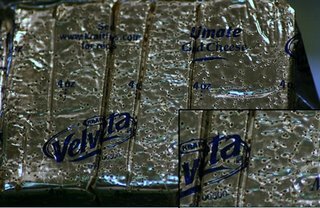 Our next theory was that certain chemical properties of the “cheese” was reacting with the aluminum wrapper, eating tiny holes in it. Anyway if anyone has any other theories would love to hear them. Now I know why Mom never let me eat this stuff and why I have a stomach ache every time I eat it. Christmas? Did you read that right? Yes you did! When I say today was like Christmas, I really mean it….literally and figuratively. Today Njagi, our counterpart in Bungoma, shipped us some packages that he’d picked up in the last few weeks. Unbelieveably there were 2 boxes of Christmas presents (from Krissy and Dorothy/Troy) both shipped months and months and months ago! Those, along with some other goodies from our families, certainly made this evening just like Christmas! A little proof of JUST how long mail can take here! Although I’m sure the senders had hoped that we would get things a little earlier, it was very fun getting to celebrate Christmas again…most people have to wait 12 months between the holidays, now we only have to wait another 6! We’ve mentioned this project in passing before, but thought it was high time that we tell a little more. As you know, we work on almost all of our side projects with Sam and Miranda. This happens for a couple of reasons. 1) Sam has a knack for offering up other people’s skills (we love it!) 2) Our skills are very complimentary so it makes sense for us to work together and 3) We rarely get a long enough break from our work with DrumNet to go find projects ourselves, so we let Sam do the work for us! 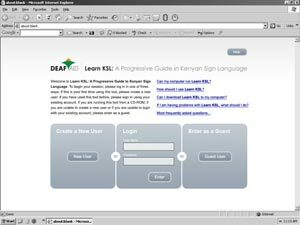 Anyway, this project is run by DeafAid, a Norwegian NGO dedicated to improving the lives of the deaf in Kenya. You’ve heard us go on and on about how underserved they are, so I won’t repeat all that. 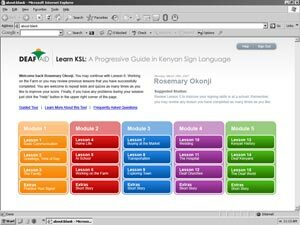 Well, this project is to help teach future (or sadly current) teachers in their pursuit of Kenyan Sign Language. As you know, teaching teachers is a “more bang for your buck” situation. We teach them, they teach many. The project is essentially a digital text book. 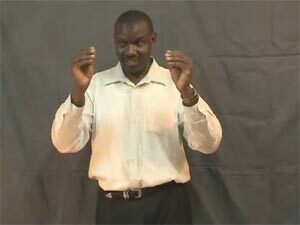 There is lots and lots of video (since sign language is a visual language it can’t be taught very well, or at all, through text only) and interactive learning pieces. The project is exciting for a number of reasons. First, we both really enjoy working on projects with the deaf community. It’s brand new to us and there is SO much to learn. Second, it allows us to do what we really love, software development. There’s lots to be done in the setup of the structure of the book, recording progress, and the interactive “game” pieces. It uses a lot of what Mark and I are best at PHP and ActionScipt. Finally it’s exciting because its e-learning. Sam, Miranda and I all have a bunch of e-learning experience and are getting the opportunity to help mold this project (rather that just be developers). Just to give you an idea of what its looking like so far (VERY early stages) here are a couple of screen shots. We hope to have a full lesson online soon to let people look at. Thanks for all the concern…we are well. Many of you know of place that holds a special place in my family called Starlight. In a tiny little town in Pennsylvania my family has had a house on a lake for many, many generations. My grandmother was born in our house, my father grew up spending summers with the kids down the lake, and my sister and I spent our summers exactly the same way the children of my dad’s friends. My family has 2 major holidays…Memorial Day and Labor Day. They are the start and finish to summer and our time at Starlight. Although both holidays are beyond wonderful, Memorial Day is always an adventure. Every year my family paddles in the General Clinton Canoe Regatta (http://www.canoeregatta.org/). Monday is host to a professional race, but Sunday is the armature relay race day. My parents have been paddling in the race since shortly after college with my dad’s college friends and their families. 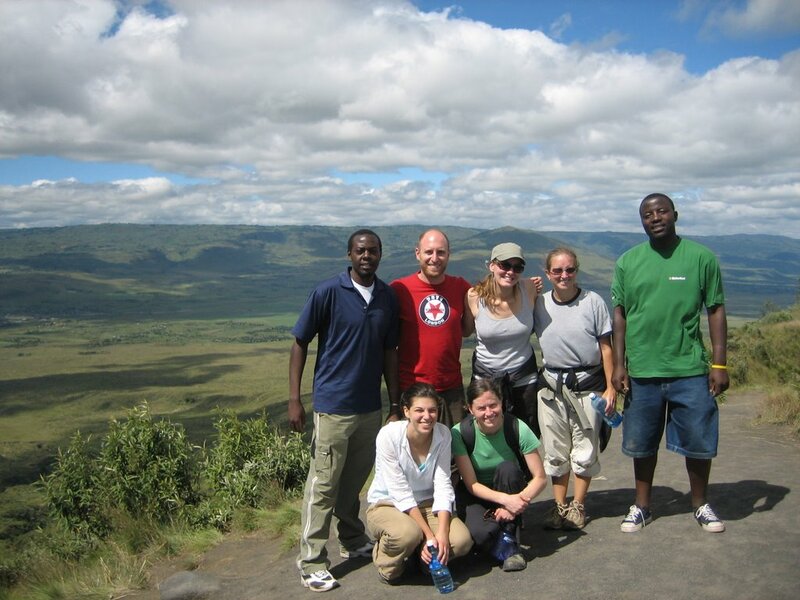 Over the years we have convinced (sometimes successfully and sometimes not) others to join us in the adventure. The reasonable ones (ok, some would call you guys crazy) understand that this is not to be missed and return year after year. 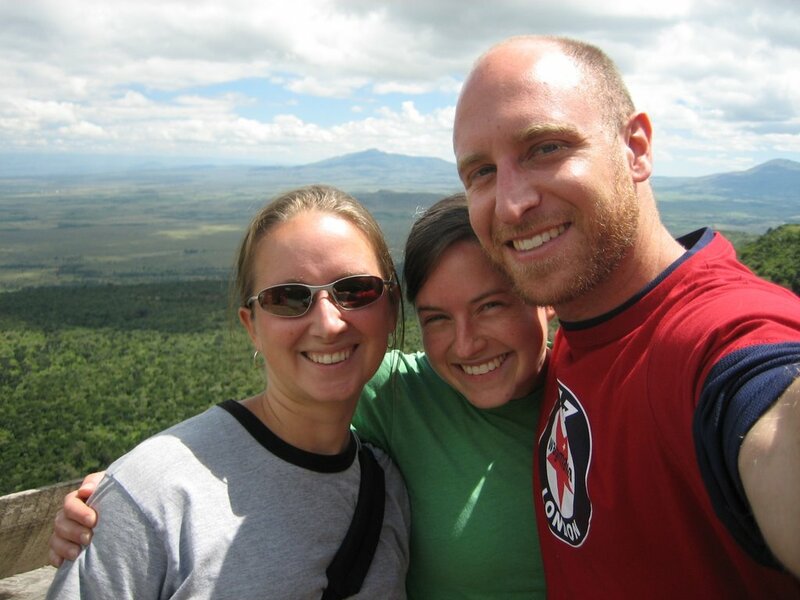 Why am I posting this on our Kenya blog? Well, as you all know my mom (and our dog Lucy) write us every week to tell us of the recent happenings. The letter I got today was about this year’s Memorial Day weekend. Turns out it was perfect (if you weren’t there this year but have been in the past, then I’m sure you know what perfect means!) Nothing makes me miss home more than the thought of a Starlight weekend with friends and family. Saturday my good friend Kevin Rodin and his girlfriend Beth arrived in town. They found themselves with a number of friends on this continent and decided to spend a few weeks traveling through South Africa, Mozambique, and Kenya. After a typically yummy dinner of Indian food, we met up with a friend of Beth’s and some of her friends (the connection between these people is beyond confusing, so I’m not even going to try to explain.) Kevin and Beth had wanted to try and climb Mt. Longonot, but our only option of getting there was public transportation which would have meant 2-3 hours each direction. 2 of the people we met after dinner had cars though, and we were able to convince everyone to join us on this adventure. 2-3 hours on public transportation turned into 45 minutes! Unfortunately Mark was feeling under the weather, so only I went. Kevin, Beth and I met the crowd at the local grocery, stocked up on food and coffee and headed out. The drive was beautiful with amazing views of the Rift Valley. After quick lunch at the base of the mountain we started up. 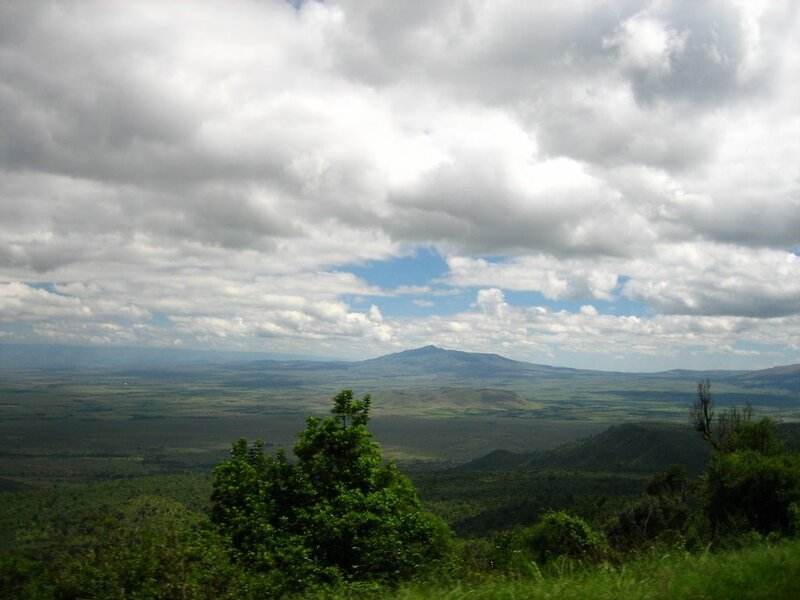 Mr. Longonot is a dormant volcano that last erupted in the mid 1800’s. The hike up is along the tree-covered ripples that was once lava. It was also very, very steep. After 12 months of essentially no hiking, it was a true B-U-T-T kicker. However, it was all worth it as the views from the top were amazing. 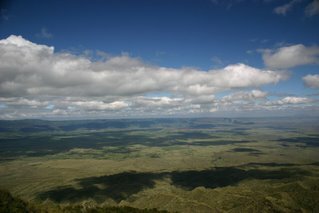 Due to lack of time we were not a able to hike all the way around the crater, but a small group of us hike a bit around so as to see a bit more of the Rift Valley. The mountain in the middle is Mt. 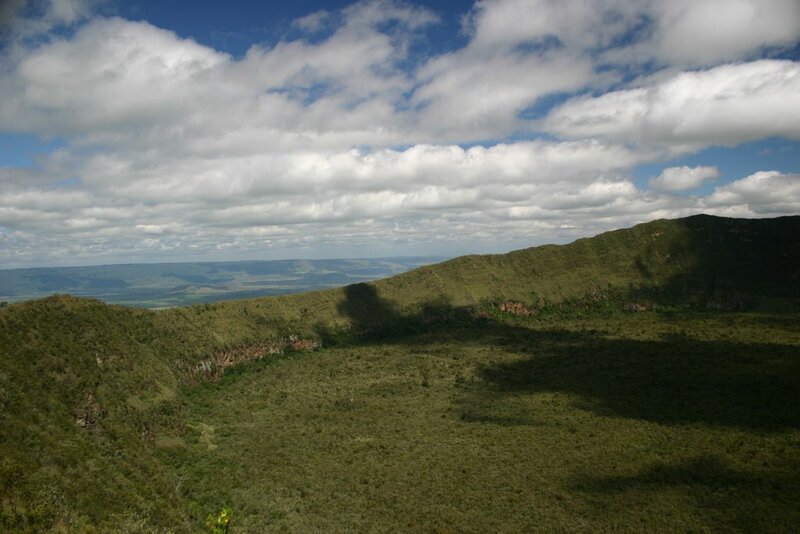 Longonot. A look down into the crater. It looks just like a lake of trees. Apparently there are bufallo and wildebeast that live down there. 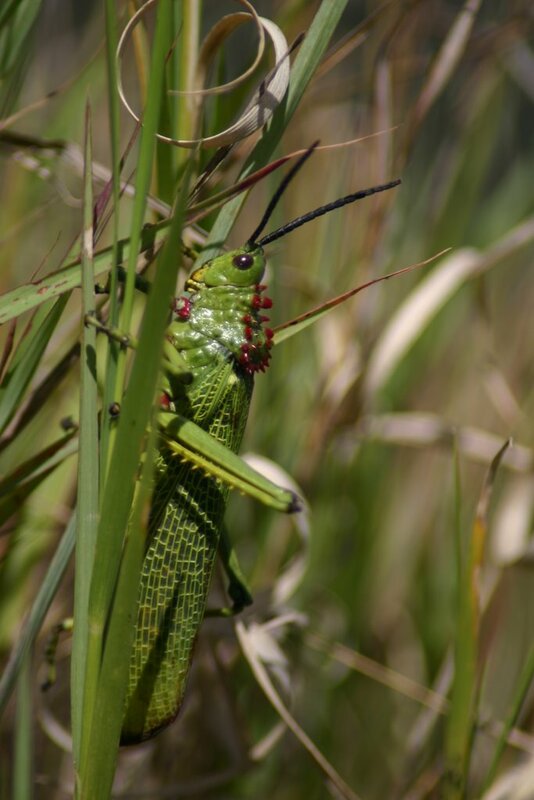 I would imagine it is a Darwinian paradise. 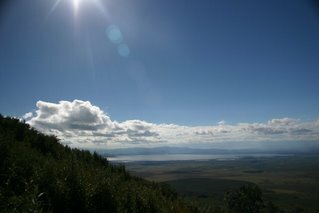 Another view from the top: This one looks north and you can see Lake Naivasha in the background. A view from the farthest point we got to. Finally, since you know we can’t pass up a good insect photo opportunity, here’s the best bug of the day!